The church on the lake at Gougane Barra makes a picturesque scene. The church itself sits alongside the ruins of St. Finbarr’s hermitage. Follow the road past the church to enter the National Park where you can explore a range of trails and enjoy the breathtaking scenery. According to local legend, Donal Cam’s wife Aoife was murdered at Gougane Barra by an English military commander called St. Leger. 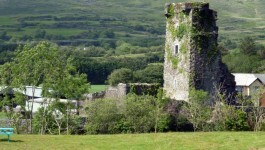 Donal Cam took hs revenge by returning to Carriganass Castle which St. Leger had seized, entering the castle disguised as a monk, and throwing St. Leger from the castle tower into the waters of the Ouvane River below. The story is the subject on an epic poem, “The Revenge of Donal Cam”, written by J.J. Callanan in the early nineteenth century. Yeats wrote that ‘An honest style did not come into English-speaking Ireland until Callanan wrote three or four naive translations from the Gaelic. Shule Aroon and Kathleen O’More had indeed been written for a good while, but had no more influence than Moore’s best verses. 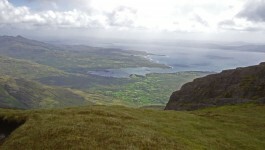 No, however, the lead of Callanan was followed by a number of translators, and they in turn by the poets of Young Ireland, who mingled a little learned from the Gaelic ballad writers with a great deal from Scott, Macaulay, and Campbell, and turned poetry once again into a principal means for spreading ideas of nationality and patriotism.